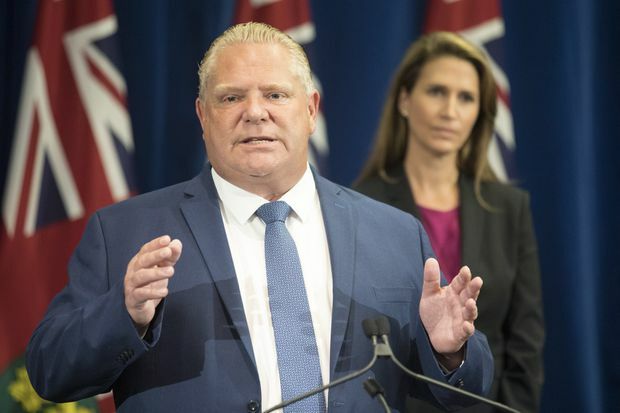 Ontario Premier Doug Ford speaks as Ontario Attorney General Caroline Mulroney looks on during a press announcement at the Queens Park Legislature in Toronto on Thursday, August 9, 2018. The Ontario government has suspended salary increases for public-sector senior executives, including those at school boards, universities, colleges and hospitals, effectively reinstating a wage freeze that has been in place for the better part of a decade. A directive sent on Monday to public-sector board chairs, a copy of which was obtained by The Globe and Mail, said the salary restrictions will be in effect until a review of the compensation program for executives is completed by June, 2019. Executives are those entitled to receive $100,000 or more in a calendar year. The new directive comes as Doug Ford’s Progressive Conservative government implements a hiring freeze across the public sector while it conducts a line-by-line audit of the province’s books. But some say the executive freeze has gone on for too long and limits the ability of public organizations to attract and retain talent. “We have employees that we feel we need to be supporting and who should be compensated for the work that they do,” said Cathy Abraham, president of the Ontario Public School Boards' Association. David Lindsay, president of the Council of Ontario Universities, said the sector helps develop a work force to keep the province globally competitive, conducts research and develops innovative ideas. “For universities to make those contributions to our society, they need to be able to attract people who can lead large, complex organizations,” he said. “This will require some long overdue fiscal discipline and spending restraint, and everyone will need to contribute. 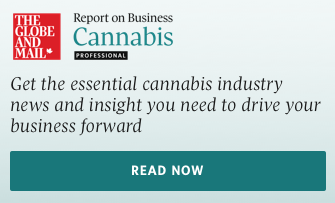 Controlling the growth in executive compensation is an important step in this effort,” he said in an e-mail statement on Tuesday. The executive salary freeze applies to all management in the public sector, including at Ontario Power Generation, Ornge, hospitals and education institutions. At school boards, for example, directors of education and superintendents would be affected by the freeze. The first iteration of a regulatory freeze for executive compensation was implemented in 2010 by the previous Liberal government. A new framework, which included public consultations within communities, allowed for raises in “pay envelopes” – pay for all senior executives in one bundle – of up to 5 per cent last year, and many school board managers were to receive incremental raises on Sept. 1. Several other sectors, however, were still waiting on their frameworks to be approved and, as a result, had not received any salary increases. The directive from Ontario Treasury Board president Peter Bethlenfalvy stated that public-sector boards are restricted from providing salary increases, and the salaries of newly hired executives are limited to what was provided to those who previously held the position. It also stated that signing bonuses, retention bonuses and cash housing allowances are not permitted, and performance pay cannot increase. Ms. Abraham said school boards had worked with the previous government on a framework for executive compensation for nearly two years. She said she was disappointed the work had now been put on hold. Matthew Reid, chair of the Thames Valley District School Board in London, said the freeze will continue to create an inequity in the system. He said that principals continue to get raises, but the salaries of those senior to them have been frozen. Further, he said that superintendents in the secular board are making about $8,000 less than those in the local Catholic board, and a wage freeze means that closing the gap won’t happen for at least another year. “There is inequity that was created when the freeze was put in place ... that must be corrected. I hope the provincial government will review the framework that was developed after years of consultations with school boards,” Mr. Reid said.